Single plate. Previously issued in pairs. 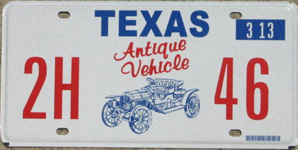 Issued for passenger cars or light trucks that are at least 25 years old and collector's items. The vehicle must be used exclusively for exhibitions, club activities, parades, or other functions of public interest and in no case for regular transportation. This is a five year plate. 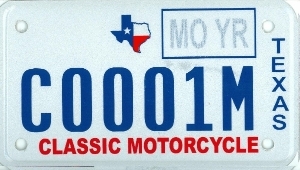 The current plate expires in 2013. Size: 1" x 2", Single sticker. This sticker attached to a metal tab allows use of authentic old license plates matching the year of manufacture of the vehicle. Issued to travel trailers that are 25 or more years old. This plate is revalidated annually by plate sticker. First year of issue: 1988? Single set of stickers. Year: 1" x 2", month 1 3/4" x 2"
For vehicles 25 or more years old displaying license plates of the year of manufacture for the vehicle. This is a set of month & year stickers, both placed on the vehicle's windshield. First year of issue: 1998? Issued to vehicles that are 25 years or older, including trailers, that were manufactured for use in any country's military forces and are maintained to accurately represent their military design and markings. The vehicle must be a collector's item and used exclusively for exhibitions, club activities, parades, and other functions of public interest, and not used for regular transportation. 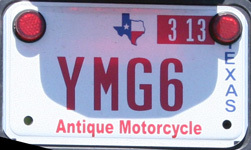 The vehicleÕs original painted military registration number may be used in lieu of the state-issued plate.